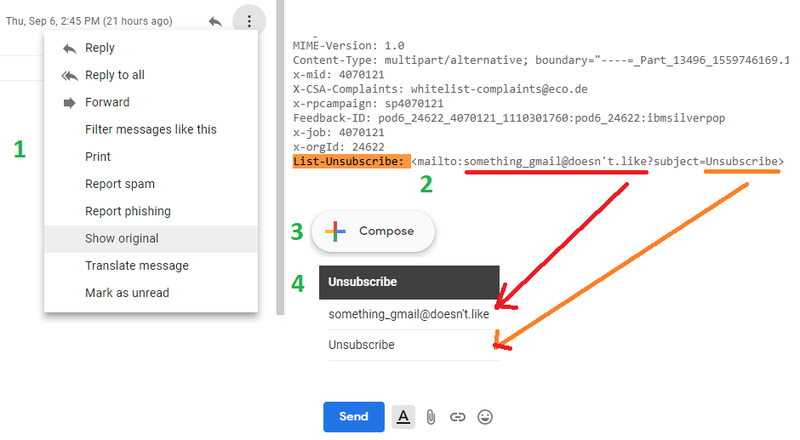 In Gmail, there's an unsubscribe option but it's only shown for senders with a high reputation when "the most basic requirements are including a standard "List-Unsubscribe" header in your email with a "mailto" URL". What if a low reputation sender does it and I decide to trust it despite what Gmail thinks on the matter? Is there any way to use that unsubscribe link despite what Gmail wants? Not the answer you're looking for? Browse other questions tagged gmail or ask your own question. How should I clean out my Gmail inbox? Why won't my Gmail signature show up in replies to new senders? List all senders in Gmail? Can I make a list of mail senders in Gmail? Can I get a list of the senders of all of the messages in my inbox?